2020 Kuemper Catholic (Iowa) defensive end Blaise made another trip to Notre Dame over the weekend and this trip was much different than when he came for Florida State game in November. The most significant difference on this trip was the smaller group of prospects on campus and that allowed the 6-foot-5, 250-pounder to get some time with the Notre Dame staff, including defensive line coach Mike Elston. 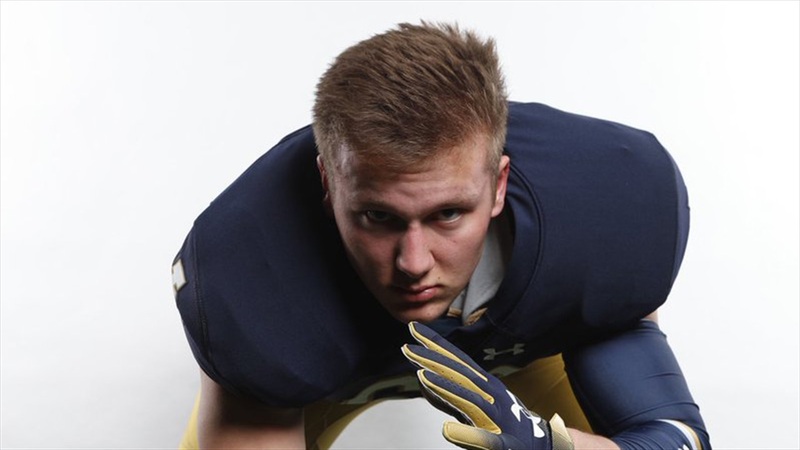 Following registration and measurements, Gunnerson was able to listen to recruiting coordinator Brian Polian speak on Notre Dame before heading off to experience campus life. “We had a really good talk with Coach Polian,” stated Gunnerson. “He did a really good job of talking about the excellence of Notre Dame. The speech he gave was really cool. The basketball game didn’t go well, but that was expected. We had a good lunch and they had some nice wings I knocked down. In addition to his conversation with Elston, the three-star prospect was able to catch up with his area recruiter, Tommy Rees. “I talked to Coach Rees for a while,” Gunnerson said. “He recruits Iowa and I have a good relationship with him. He’s stopped by my school a couple times. When it comes to an offer, Elston was straightforward with his Iowa native as the Irish are interested but want to see how he comes back from a torn labrum in his hip. The honesty was well received by Gunnerson and he’s on track to be able to impress Notre Dame and other coaches by the start of the summer. While the injury has put a small delay on his recruitment, Gunnerson has remained positive and believes once he can work out, the offer list of Iowa, Iowa State, Minnesota, Nebraska and South Dakota State will only grow. The glamour of Notre Dame was on full display over the weekend, but the Kuemper Catholic standout was also impressed with some raw numbers. “Coach Polian gave a couple slides on academics,” stated Gunnerson. “One was comparing graduation rates for African-American individuals and white individuals with all other schools. Notre Dame was way ahead of every other school by 5-10%. Gunnerson isn’t slowing down on visits as he will make a few more visits in the near future.